For those who are too young to recall the marvel and sheer monstrosity, not to mention the high cost, of early cell phones and “car phones”, we’ve really come a long way towards making cellular a feasible option for IoT and automation. These days it seems like everyone wants cellular data service to connect their device when away from secured wifi hotspots. With all of the cost competitive cellular data service options offered over increasingly massive LTE/4G wireless networks, accessibility and availability is at all time highs. There are numerous use cases for the use of cellular data services rather than shorter range wifi, Zigbee, Lora, and other wireless technologies for embedded and IOT edge applications. In this article, we’ll show you how to integrate LTE/4G capabilities with NetBurner devices. My oh my have we gone a long way in cellular! The first Motorola car phone from 1964 (bottom). “Smaller” versions from the 1980s (top left). 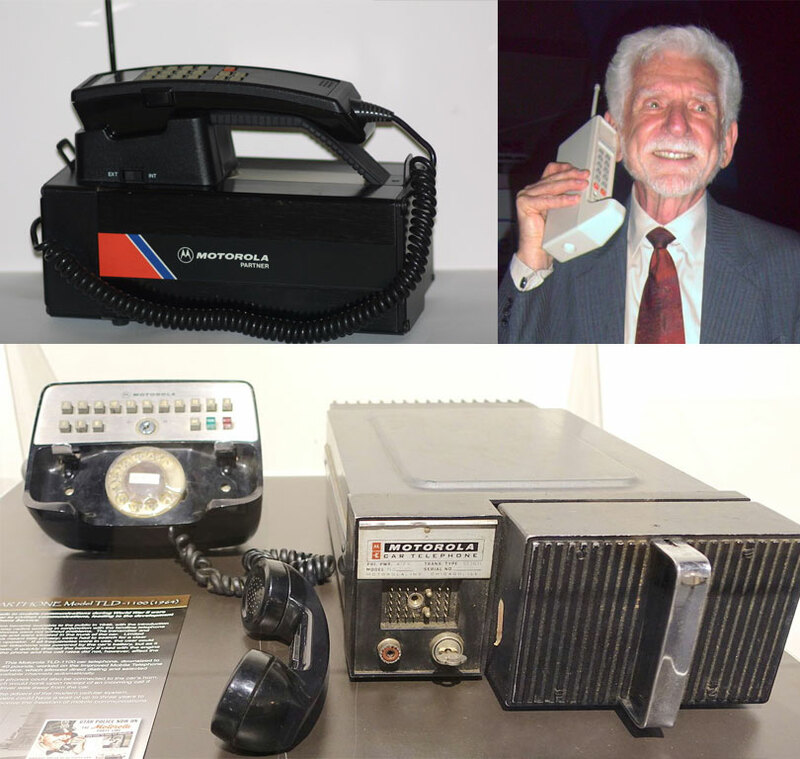 Martin Cooper of Motorola with a mobile phone first tested in 1973. This project will describe a method to add a cellular modem into the NetBurner as a TCP/IP interface component. The NetBurner communications setup discussed in this paper consists of three major components. The project uses two wall wart transformers, one for the cellular modem board and one for the SB72EX. The Netburner communicates with the cellular modem board using RS-232 at 57600 baud, with no parity, 8 data bits, and 1 stop bit. 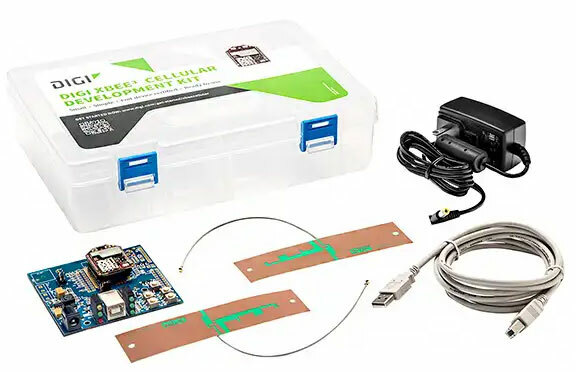 The XBEE kit comes with at least 90 days free connectivity with AT&T through the cellular interface and antennas. 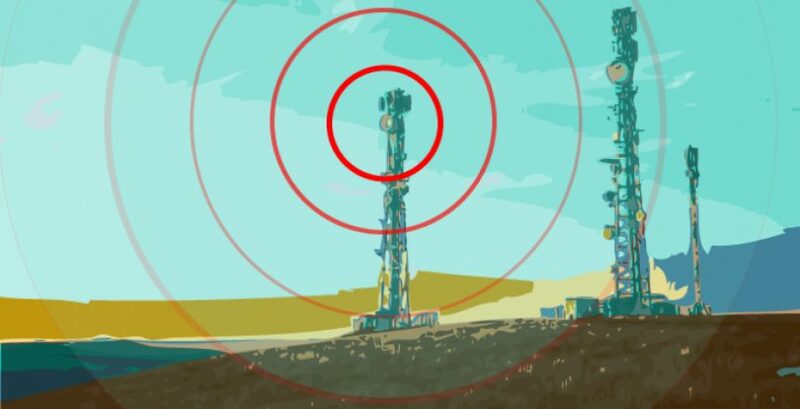 If you are close enough to a cell tower it is not necessary to use the secondary antenna of the two. See the XBEE user’s manual for more information. In this example we are using the DIGI XBEE3 kit along with a Netburner SB72EX serial communications device, although any Netburner board / module will work providing that a second UART port is available with full handshaking connections along with the Debug serial port. The DIGI kit provides a Telit LE866 Series cellular module, 2 antennae and some handy applications that can be used to configure and update the device. 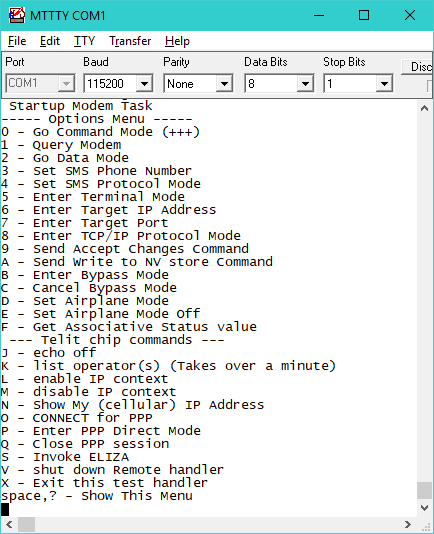 The XBEE cellular modem has at least two major modes of operation: “Transparent” mode and “Bypass” mode. There are others, like “Micro Python” mode, that are not covered in this paper and are not necessary to us here. Bypass mode is discussed in this article at various points, and its purpose is to allow us to talk directly to the cellular network chip. The Telit cellular module chip supports two interfaces: AT commands and PPP communications. See the manuals listed at the bottom of this document for more information on the Telit chip. The cellular modem can provide the TCP/IP connection to your NetBurner platform by adding some hardware to the development board, placing the modem into bypass mode, and connecting to the cellular modem using PPP (point-to-point protocol). On the next page a drawing of the system shows the location of the level shifter board on the DIGI development board. 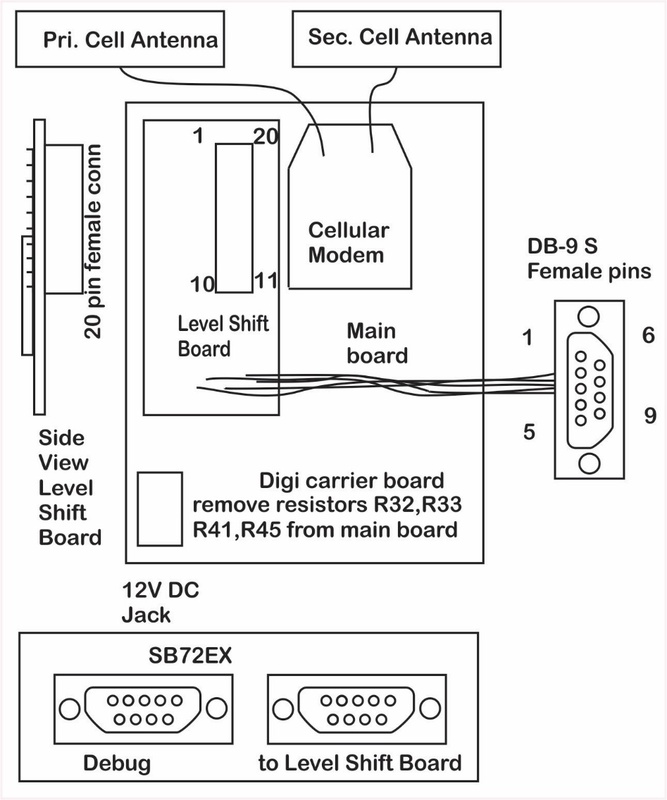 Before you develop or install the level shifter, you should follow the instructions that come with the DIGI modem development kit. Install the XCTU application and connect to the DIGI modem module through USB as the manufacturer has specified with this kit. Talk with “ELIZA the cyber-psychologist”, send a text message to your phone, and perform any of the other documented experiments in the DIGI user’s manual. It is valuable to work with the cellular modem board using the Digi application XCTU running on Windows initially in order to get used to working with the modem at the high level before adding the level shifter board and using bypass mode to connect with PPP. When you are ready to attach to NetBurner, review section 2 of this article below, change the parameters, and then move to section 3 of the article to build the level shifter. Using a level shifter to convert the modem output to serial. Use the XBEE default USB cabling and follow the instructions in the XBEE user’s manual to bring up the list of modem parameters on XCTU. The Association Indicator tells you a lot about what the modem is doing and what state it is in. If the value is 2A then the modem is in airplane mode, if the value is 2F it is in bypass mode and the micro-python and command API firmware features are not alive in the modem. When you are in the XCTU application you want Airplane Mode to be (0), and the Association Indicator to be something other than 2F, in other words, not in bypass mode. Connect the XCTU application to the XBEE modem/dev board. Now the modem is setup and ready to operate with the NetBurner library and the sample application. Go to the next section and build up the serial port level shifter hardware. The Netburner communicates with the cellular modem through its serial port. The XBEE module supports 3.3 volts on DIN and DOUT lines, so we use a MAX3232 3.3V level shifter chip for use with RS-232 signals on one side and 3.3V signals on the XBEE side. The XBEE board uses USB to communicate with your computer when you get the kit initially, but to move forward and use the cellular modem for the Netburner TCP/IP interface, you need to use the RS-232 interface. The XBEE board numbers the 0.1 x 0.1 inch 20 pin dual row connector in the same manner as the modem module- which is not compatible with the usual numbering scheme of these dual row connectors. On the schematic above I have both numbering schemes shown together, with the numbers on the outside edge representing the modem module’s number scheme. The modem uses handshaking signals as shown on this schematic. I have specified a DB9-S DCE connector that is ready to plug into any DTE 9-pin connector, such as the SB72EX or a PC serial connector. I decided to hand-wire my level shifter board and a dual row 20 pin female connector on the bottom of the board using a part such as the Mouser M20-7831046 (note that despite the reference image, it is a 2 row, 20 pin connector). There are several ways to accomplish this, however. If needed, you can find a MAX3232 level shifter breakout board from SparkFun here. You would then connect the wires from the DB9-S DCE connector to the corresponding signals on pins 1-4 of the breakout board. Similarly, pins 5-10 on the breakout board would then be connected to the corresponding signals on the XBIB-U-DEV development board. ***Important Note: Four resistors are removed from the DIGI development board to take the USB UART out of the circuit. They are R32, 33, 41, 45. Once the resistors are removed and the level shifter is installed, it is still easy to communicate with the cell modem using the XCTU app by specifying that it uses the COM port address of your laptop or PC instead of the USB port you were using initially. You can use XCTU to test your level shifter board. The Netburner application is controlled through the Debug COM port. This is the menu as supplied to the debug port at 115200 baud, with no parity, 8 data bits, and 1 stop bit. When you place the modem into the Bypass Mode, you are removing the on-modem microprocessor from translating between you and the actual cellular processing chip, the Telit LE866 chip. The process of place the modem into bypass mode is straightforward, but you must check that the modem has made the transition to bypass mode by querying the AI (key F on the menu) until the result is 2F. Once you are in bypass mode the modem will stay there, even through power cycles. Now the next step will be to bypass the modem’s microprocessor and talk directly with the Telit cellular chip on the XBEE device. This chip can perform certain tasks for you like reporting all of the operators it finds in the RF stream, and connecting via PPP to the Netburner library. To enter bypass mode, press menu item ‘B’ and give the modem 4 or 5 minutes to reboot and the cellular signal to re-acquire. The RED LED which was blinking in non-bypass mode stays on solid in bypass mode. Query the associative status value by hitting key ‘F’ until you get the 2F response, as mentioned previously. You are now providing the Netburner TCP/IP stack with an internet connection through the cellular network. Go ahead and unplug the Ethernet cable from your Netburner while you are testing to prove your connectivity is through the cellular modem. Below is a screenshot of the procedure to connect with PPP, invoke ELIZA on the internet, and shut down the remote handler with key ‘V’ and scuttle the PPP session with key ‘Q’. Eliza data captured over cellular as seen in the serial terminal. Generate the custom hardware that accepts the XBEE modem and provides the level shifter hardware. 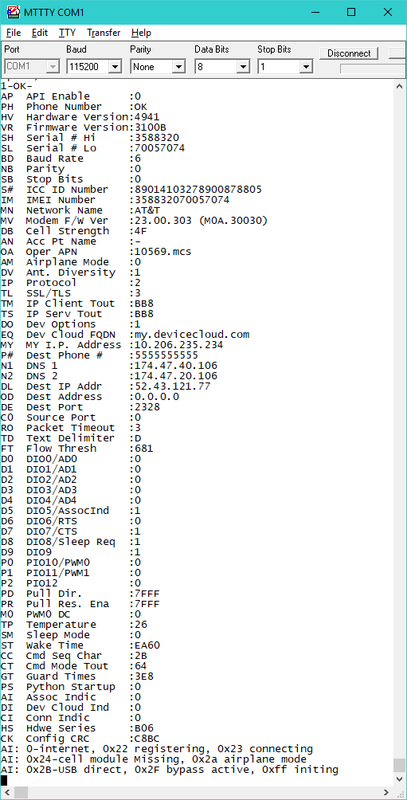 Setup XBEE modem using XCTU application to all of the above specified settings PLUS placing the modem in Bypass mode. Save all to non-volatile memory in the modem so it reverts to this each time after power cycle. Build a state machine that will walk the modem and the PPP library through the connection states after power-up. The code would need to check the Assoc. status, place the Telit chip in non-echo mode. Invoke PPP and check for a successful connection to be established. Build your Ethernet-based code with web pages, sockets, UDP handling, etc. The example code that is loaded onto the SB72EX for the cellular modem project is brand-spanking new, and as such it hasn’t yet made it into any of our current releases. However, we would be happy to send it to you if you want to start working on your own personal cellular modem application. Send us a note at sales@netburner.com, and we will send it your way. Look for more examples and information to surface as we continue to incorporate this exciting technology into our products.